The Forum is one of Melbourne’s many stylish venues. Built in the 1920s it has a baroque level of art nouveau features with a high-level of Hellenic influence. 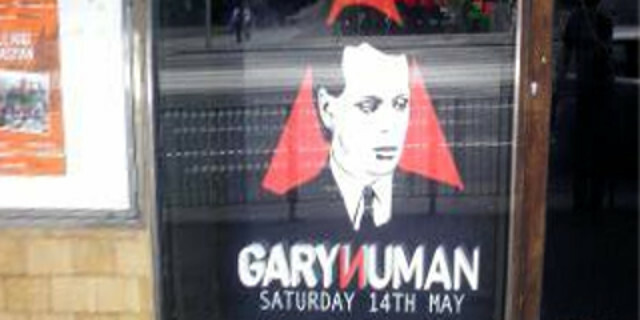 Designed for theatre and ‘talkies’, as they called back then, it proved to be a somewhat unusual venue for Gary Numan’s tour for the thirtieth anniversary of Gary Numan’s 1979 LP The Pleasure Principle with local band Severed Heads in support. The austere electronica, “slow industrial” as one punter put it, was at serious juxtaposition with the surroundings. One cannot sing great praises for the acoustics either. The high roof of the main hall was perhaps acceptable, but the speaker system for the low ceiling under the balcony was very ordinary. Clarity of sound shouldn’t be an issue with either of these performers. Severed Heads played a typical set, which means minimalist audience interaction and annoyingly short, just under an hour. Although the band officially stopped working in 2008, they returned for a thirtieth anniversary show in 2010 and has revived itself for a second time to act as support for Numan’s Australian tour. This time however they assured us that this was their last ever show — really! Their self-produced computer-generated videos as always provided an excellent complement to experimental electronica, especially prominent in the brilliant “Choose Evil” (featuring trumpet-playing skeletons in sombreros) and the thoroughly bizarre “Oblique Firefly Overlocker”. Other pieces of note include “Pilot in Hell”, the classic “Dead Eyes Opened” and, most appropriately, their final ever song “Heart of the Party”. The audience showed their appreciation for their sustained effort over the decades with the most enthusiastic concluding applause that’s been heard for some time for a support band. Gary Numan’s set, not surprisingly, started off with a number of tracks from The Pleasure Principle, including “Airlane”, “Metal”, a somewhat disappointing version of “Tracks”, “M.E.”, “Observer”, “Conversation” and “Engineers”. It was obviously appropriate and the audience appreciated what was being performed, but enthusiasm was somewhat reserved until the classic “Cars”. Despite being provided a much larger and more prominent screen, Numan hardly made any use of additional video display, although the light display was far superior and evident right from the start. Returning from a break Numan returned to the set with a surprisingly higher degree of energy and stormed right in with an enthusiastic version of “Down In The Park”, a song whose popularity can be measured by the number of times it has been covered (Marilyn Manson, Foo Fighters, Christian Death and performed by Nine Inch Nails). Brilliantly composed and executed Numan lapped up the applause with what would be come one of many expressions of the Jesus Christ pose, which is a little too disturbing coming from a man who was, and still looks like, a Young Conservative. There was perhaps a little too much of Numan’s more contemporary forays industrial music in the latter part of the set (e.g., “Haunted” and “Pure”) which may sound strange to Numan gronards, but are appreciated by the younger listeners. All however, reacted well to an clever pre-encore version of “Are Friends Electric?”, combining spoken voice, switching to powerful instrumentation, and extending with audience participation. Unsurprisingly returning to stage, as an encore Numan played another short set concluding with “I Die: You Die”, a fairly melodic and almost ballad-like conclusion which featured the best lighting accompaniment for the evening. This was a fairly good concert that was critically spoiled by a combination of the venue’s acoustics, the shortness of the Severed Heads set, their lack of engagement with the audience. Whilst it is obviously too late now, at least for a final performance it is worth really giving an audience a lot of extra feedback. Whilst it may sound like total heresy, Numan’s set was perhaps too long in comparison and could have had some of the less prominent songs replaced with well-known missing hits like “Music for Chameleons”, “We Are Glass” and “She’s Got Claws”. Overall however, this was worthwhile, a fine anniversary for a classic album for one performer and a valediction for another. Pink Floyd sell actual bottom of barrel with scrapings. The past: delete, not notable.